Baan Panburi have done the same thing as Flip Flop Pharmacy: after being shouldered out of Thong Nai Pan Noi they have re-opened on the next beach, namely Thong Nai Pan Yai. Is this a trend I see? Are the older businesses from Noi all going to move to Yai as Rasanada slowly buys up the whole beach? Anyway, this is good news. Baan Panburi became very popular in Thong Nai Pan Noi. The rooms were cheap but had air-con and closet space, and the 'Beach Club' did average food but had a great happy hour. The staff at the Baan Panburi in Thong Nai Pan Noi used to be excellent, especially Boy and the two women (I forgot their names). It looks like the new Baan Panburi Village in Thong Nai Pan Yai is very similar to the old one. 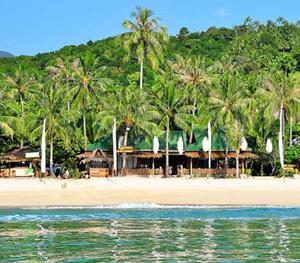 There's a big restaurant on the beach and the bungalows are made of bamboo and wood and offer great value. Garden Huts are 300 to 600 THB, the Seaview Huts are 900 to 1,500 and the Thai House is 700 to 1,400 THB. 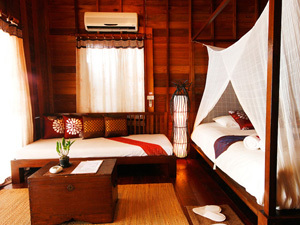 The cheap bungalows are fan with cold water and the Seaview bungalows and Thai House has air-con and hot water. The interior of the Seaview looks well done from the picture below. Although the choice of accommodation types is limited at the moment, they have just opened and are sure to add bungalows and cottages over the following year. They are also sure to have a happy hour, regular BBQ nights and Thai dancing for the peak and high seasons. Baan Panburi has a lot of experience in catering for guests in Thong Nai Pan and it will be no doubt a popular place to stay in Thong Nai Pan Yai. Things have indeed moved on since the first hippies discovered the tucked away beaches of Thong Nai Pan Noi and Thong Nai Pan Yai. The area seems to have by-passed the phase of being over-run with Israelis clutching their army pay and gone straight into the mainstream of tourism. The latest tours by Saga include Siam Island Adventure. It is an 11 night tour that costs £1,549. For the same money I could travel around South America for 3 months. Nevertheless, for those who don't want to think about buying tickets or finding places to stay the package tour will always remain popular. The Japanese who fear that all the world is dangerous bar for their ugly city or town where they live, the guided tour is the norm when going abroad. The 'Siam Adventure Tour' starts in Bangkok and takes in Hua Hin and Chumphon before hitting Koh Phangan. Tourists are treated to 2 nights at Havana Beach Resort in Thong Nai Pan Yai before visiting Than Sadet and then moving on to Koh Samui. What is interesting about the Saga holiday to Koh Phangan is that it chose Thong Nai Pan rather than Haad Rin, Haad Yao or Ban Tai as its beach location. This is confirmation perhaps that Thong Nai Pan is the best beach on the island. It is also intersting to note that the price of £1,549 is not enough to stay at the better resorts of Santhiya, Panviman or Rasananda. In a way I'm pleased as I like the owners of Havana. However, if you are reading this and you are thinking of going to Koh Phangan for the first time, then unless you are old don't waste your money with Saga. Thailand is one of the safest places to travel in the world. Why not make your own way down to Koh Phangan from Bangkok and why not give some of your money to the local businesses along the way instead of giving it to corporate entities in First World countries?